Ramps are a springtime delicacy which are only available for a short time so be sure to grab them when you see them. You’ll most likely find them at farmer’s markets or roadside farm stands where they might also be called wild leeks, wood leeks, wild onions, and/or wild garlic. 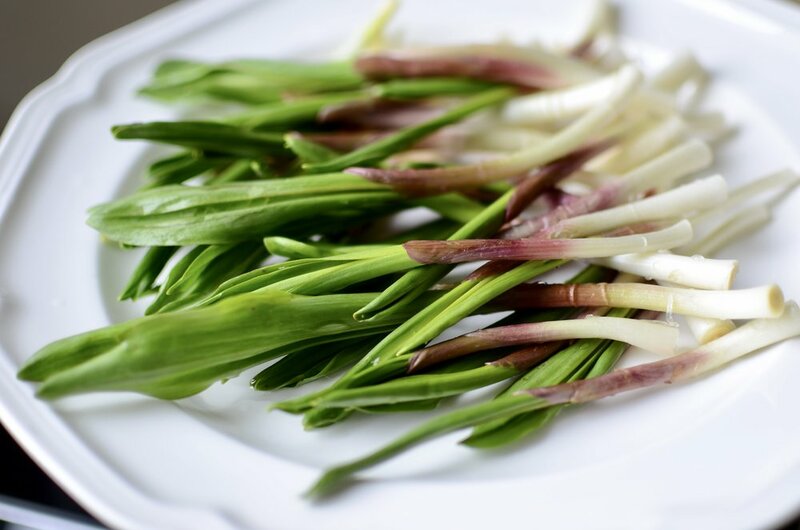 Ramps are not cultivated, they’re foraged, which can make them a little on the pricy side, but they’re wonderful and I highly recommend you give them a try. Raw, they have a very pungent aroma that is hard to miss, but cooked, they have a mellow onion/garlic flavor. Here’s how I like to coo them. Ramps are usually pretty dirty so wash them well under cold running water and shake off as much water as possible. If you don’t plan to cook the ramps right away, roll them in a layer of paper towel and place in a large zipper storage bag for 2-3 days (be sure to seal the bag well to keep the strong aroma of the raw ramps from permeating everything in your refrigerator). When you’re ready to use the ramps, trim them the same way you would a scallion. Remove the root end and any dried or damaged outter layers… and if needed, any slippery membrane that may be present. Over medium-high heat, drizzle a tablespoon of olive oil in a cast iron skillet. Add the ramps and add a pinch of kosher salt and pepper. Allow the cook until they start to caramelize and/or blister on first side before flipping. After just a few minutes on each side, they’re ready. Oh how I wish you were here to try them. Serve as is or chop them up and add to other recipes like my Frittata with Ramps, Bacon, and Mushrooms. Enjoy! Heat olive oil in a 10-inch cast iron skillet over medium-high heat. Place ramps in a single layer and sprinkle with kosher salt and freshly ground black pepper; allow ramps to cook, undisturbed, for 2-3 minutes per side until they caramelize and/or blister.